I have wanted to read this book since the time it has been translated and out in the market. However, I did not get to for a while. I managed to finish it last week and I love the books that interest me – whose story lines are so different and which have way too many layers to them. 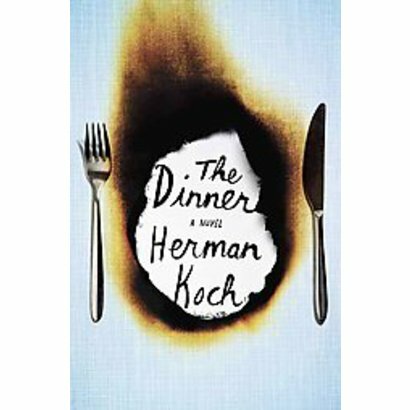 “The Dinner” by Herman Koch is definitely one of them for me this month. “The Dinner” is a book written in Dutch and translated wonderfully by Sam Garrett. This is also one of the reasons I enjoyed this book a lot. I am biased towards translated works and maybe that is why. The plot: Two couples meet at a fancy restaurant in Amsterdam over dinner, discussing everything under the sun, from movies to life to their relationships. The topic of the evening is skirted many a times before getting to it, which is about their children. The evening then takes an ugly turn when secrets tumble out of the closet, for both the families (who incidentally are related to each other, brothers and their wives) with disastrous consequences and revelations that the reader is taken by shock with when he or she reaches those parts. What I liked most about the book is the suspense element and how the placing was done. The revelations are done not hurriedly, giving reader the time to take in what is there to offer. The conflicting opinions of the brothers and the wives’ reactions to those are superbly done. The writing is simple and yet so much to give the reader in terms of structure, plot, atmosphere and the narrative. Koch uses his words sparingly so, which again was a plus where I was concerned, because I do not like unnecessary use of language in a book, when not required. Family relationships are difficult to be brought out in books, or at least so I think. There are very few authors according to me, who manage this quite brilliantly and Koch is maybe in that league. He has written several other books and I can only hope that they also get translated, after the success of this one. I thoroughly enjoyed this book and it also reminded me of the movie Carnage in bits and pieces, which was a good thing and yet somehow I did not want any reference or reminders, but I am overlooking that, because the book in itself is superb. This entry was posted in Books, Hogarth, Literary Fiction, Review, Translated Works and tagged Crown, dutch, Herman Koch, Hogarth, literary fiction, The Dinner, Translated Works on March 9, 2013 by thehungryreader.